Verizon's New Jersey headquarters is a complicated place. Part bunker, part weirdly Buddhist sanctuary, it housed the original AT&T before the government cut it up into little pieces, half of which became Verizon, and half of which have congealed back together, T-1000 style, into Verizon's biggest competitor. I'm told when Verizon moved in, the exorcism cost millions. That's partly the reason they brought me out: To exorcise the notion that AT&T is winning the race to change the way you watch television. Verizon showed me a new version of FiOS TV that will start rolling out to customers any day now, and hitting everyone by end of the year, with a feature set rivals that AT&T's U-Verse, including interactive content, PC connectivity, RSS feeds, even the ability to see what your neighbors are watching in realtime. FiOS, as you might know, is Verizon's fiber optic television service (which is now officially invading all of NYC). It's not full-fledged IPTV yet (since it's not delivered entirely as data packets, as I learned a few weeks ago), but Verizon is implementing a lot of the same feature set that IPTV makes available. Version 1.5 was mostly about meeting regulatory specifications, so they're just now popping in the big features. The onscreen interactivity feature set is a lot like what cable and IPTV are doing-a pop-up will offer bonus or expanded content like clips or info-and it'll debut with a bunch of NBC Olympics interactive content, which will be the Verizon framework's first major test. Essentially any network can dump content into Verizon's framework, and voila, interactive content ahoy. FiOS TV 1.6 also adds in RSS feeds from content partners, providing live info like traffic, weather and horoscopes (apparently their test groups really wanted them). Unfortunately, right now, you can't add in your own feeds (like Giz) but the framework is there to do it in the future. Currently, weather and traffic are the ones you'll actually check out. One weird quirk is that you have to pause whatever you're watching before you start reading feeds-you can't pause TV while you're reading. Starting with 1.6, you'll be able to stream two HD streams to multiple rooms in the house, even with the current boxes-Verizon's goal is to have feature parity across all hardware. But one of the more awesome, though subtle, features is the ability to pause a channel, swap to another one, pause it, then go back-so you could juggle two football games or Heroes and football, whatever. They've also added in filters, so you can have the menu show you just your HD channels, just family channels or just movies, to cut down on the amount of crap you have to scroll through. A fully personalized setup like AT&T showed off is probably a version or two away, though. Scheduling recording by web and phone is in the works too, though it'll start out as a premium feature set and trickle down. What Verizon is doing that's somewhat unique is a hidden form of social networking. 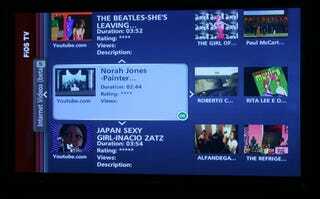 There's a new section called "What's Hot on FiOS." It tells you the top five most popular shows in your area at that second, live. So if you don't know what to watch, you can just check out what everyone else is. This works for On Demand stuff too. And now for the future stuff (which is actually built into the 1.6 update, but it's hidden, so if you hacked your box....): Integrated web video, of course. YouTube, Veoh, Break and Blip.TV for now. It's sectioned off in the menu, so people don't expect to be blown by awesome vid quality, I'm told. The setup actually uses your PC as a proxy, so you actually have to have it turned on to watch web video. But you can also stream pretty much any video, any codec flavor on the fly, from your PC to your TV. The search engine isn't that great yet, and typing is annoying, but it's nice to see this stuff integrated and easily pushed to your TV. If trials all go well, you'll see this stuff on boxes as early as spring 2009. If not, well, things get murkier. The fact that most of this stuff will be in people's houses by the end of this year does seem to put FiOS ahead in the feature war, even though Time Warner actually has a bunch of its suped-up tru2way boxes in the wild. Either way, it proves that TV as we know it is going to change, at least a little bit, by letting in stuff from outside the garden, no matter who your provider is.